This is a flag for the flower shop that faces Route 2. Even though the shop was destroyed by an earthquake, the owner found the flag in of a heap of rubble and put it up at the re-opened shop. The flag, rising from the debris of the quake, echoed the owner's own determination to continue. 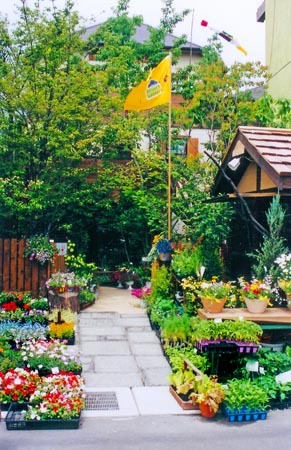 This flag shown above is designed after the revived Ashiya Garden.